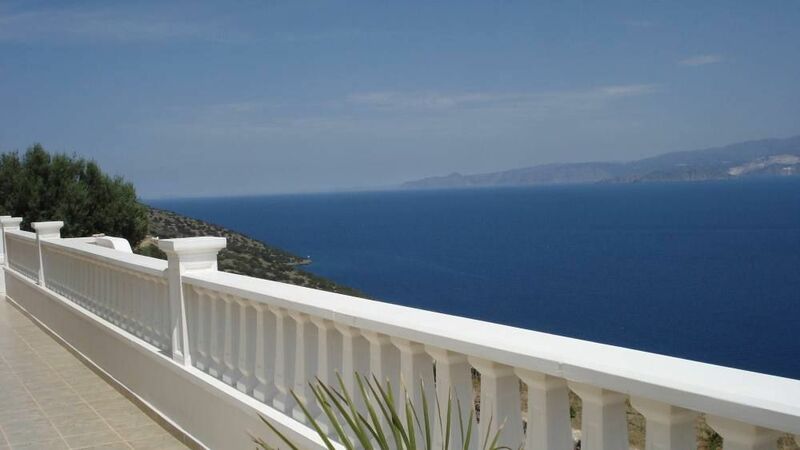 Beautiful villa without vis-à-vis on a large lot overlooking the Gulf of Mirabello. This magnificent villa on the best-preserved area of ​​Crete, whose waters are the most clear and clean of the island enjoys a micro -Climate breast and particularly dry. Are particularly valuable open spaces around the villa with grass, flower garden, pool and large protected beach. Balconies and terraces illuminate the villa and give each piece the possibility of sun exposure while preserving privacy. The interior, very complete, made from a blend of simplicity and old furniture provides a sense of comfort and well being. The view is breathtaking from every point of the house and allow to contemplate the entire gulf, the town of Aghios Nikolaos, port and boat movements, the islands and the surrounding mountains that change color throughout the day. Very easy 50-60 minutes (max) pretty direct car journey from Heraklion to this villa. If you want space for a couple of families, easy access to some decent local beaches, restaurants/bars etc, a stunning elevated 180 degree view of blue sea and mountains and your own crystal clear pool - this is the one. Just had 10 days here in August (2018) and were delighted with the choice. Eleni the owner is a wonderful, friendly host, the villa is extremely well proportioned and designed, all clean white walls inside and out, large communal area first floor and two x double/two x double single rooms upstairs all nice size and air conditioned. Each double/single pair has their own bathroom/shower. Supermarkets available in Agios for food, a 10 minute ride away. You will need a rental car for getting around. Note that Crete is quite hilly so recommend paying a bit extra for a car with some oomph to get up to the hills and up/down from beaches. This villa has an unbeatable gorgeous view that you will happily sit and look at for hours, glass of Cretan wine in hand. Great for kids, our 10 year old never wanted to leave, but like most villas in Crete there a few steps and it is positioned on a hill (there is safety fencing so no material concerns) but the more hands on parents out there would need to watch the very young, under 4s. Local sea water is clear, clean, lovely temperature and jelly fish free. All in all can't recommend this place enough. You will not be disappointed. From the airport (or port of Heraklion take the direction of Agios Nikolaos. At the first traffic lights turn left towards Elounda. On the 3rd km turn left.